I remember my first conscious decision about my taste in sandwiches. I was in first grade and was bored with Peanut butter and jelly sandwiches. My mother, who was keen on this fact, starting making me baloney sandwiches. Now as a kid growing up, unlike the kids today, you ate what was on the table. There were not separate dinners for adults and different dinners for the kids, only smaller portions. So I had fairly decent exposure of different meats at a young age. So it did not take long for me to realize that these baloney sandwiches were really a pretty crappy meat. So I go home and tell my mom, at age 6, please don’t make me baloney sandwiches any more as they were not a quality meat. Hence the spoiled little me was beginning to shine. She never served me baloney again and I never ate it again. This sandwich is a real crowd pleaser and had I had this sandwich to trade in the school cafeteria, I could not only have traded but probably made some money, although I don’t recall anyones lunch being worthy to trade for such a sandwich as this. Remember, if it’s baloney it’s CRAP. 4 Slices of Bread, not processed, Ciabatta would have been great had I had some. 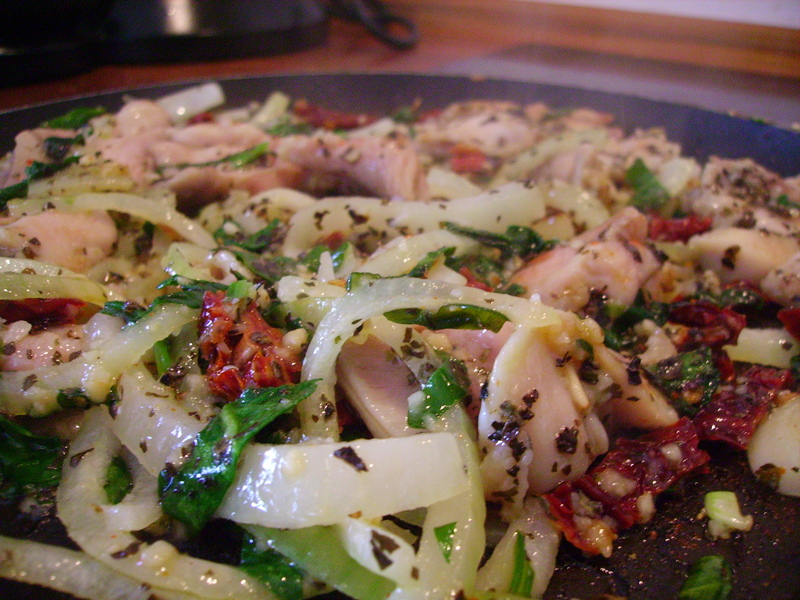 In a saute pan add your olive oil and heat on medium high heat. 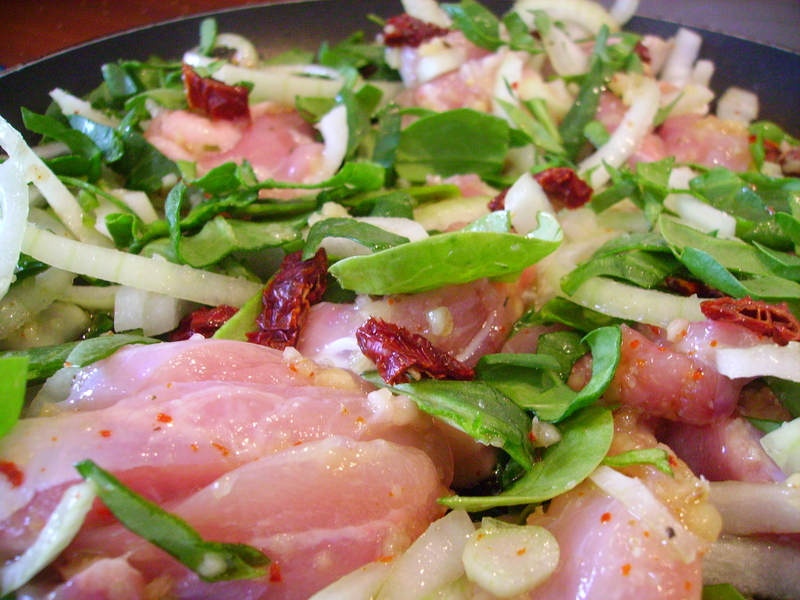 Add your chicken thighs, onion, red pepper flakes, spinach, garlic, basil and sun dried tomatoes and stir until incorporated. 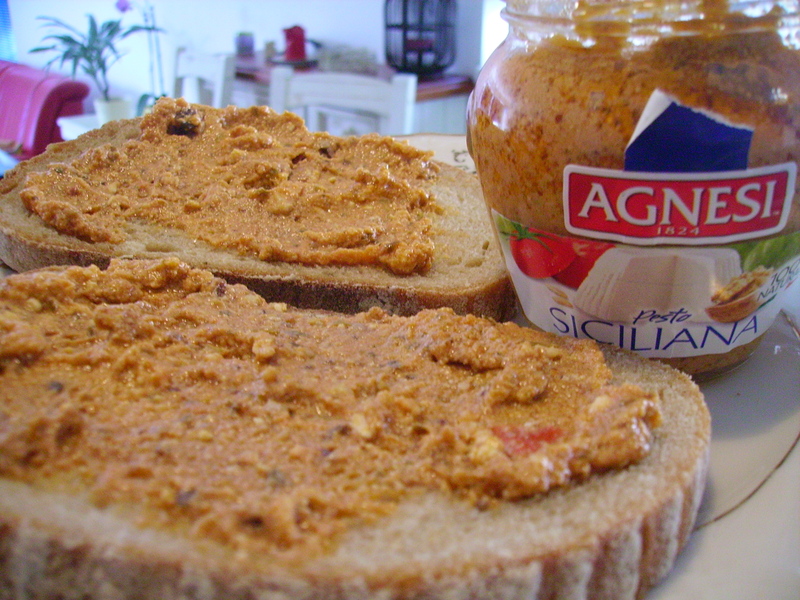 On your bread spread 1 tbl of the Sicilian pesto on each slice of bread. Sicilian pesto mis a rich pesto made with Tomatoes, pine nuts, walnuts, olive oil, ricotta, and basil as its main ingredients. Definitely thick and rich. Continue to stir the ingredients in your pan frequently and as the pan begins to dry out add your wine and stir scraping the bottom. some added flavor but also to bind the ingredients together so they don’t fall out of the sandwich like eating a sloppy joe. Stir in the cheese until it is incorporated throughout out and then just place on your bread and serve. 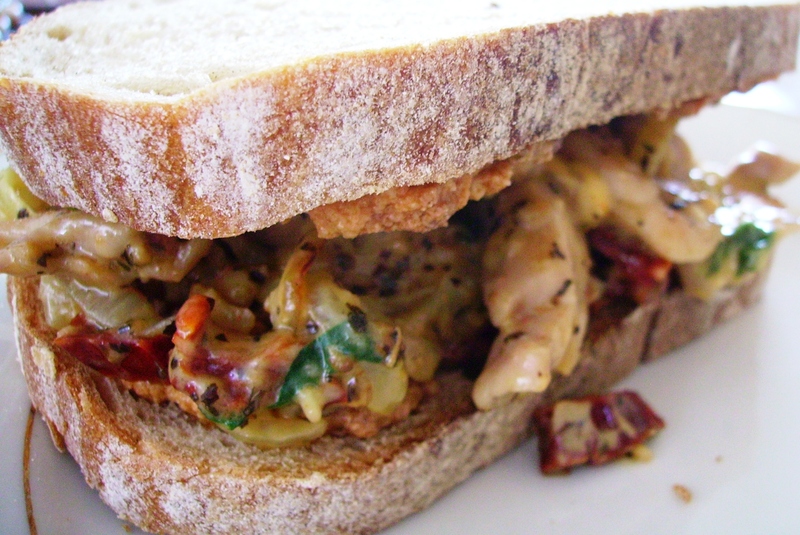 This entry was posted in American Cheese, Baby Spinach, Basil, Bread & Grains, Cheese, Chicken, Chicken Thighs, Cooking, Cuisine, Dinner, Eating, Extra Virgin Olive Oil, Food, Garlic, Gorgonzola, Herbs & Spices, Meat, Nuts, Olive Oil, Onions, Pine Nuts, Recipes, Red Pepper Flakes, Rose Wine, Sandwiches, Sauces & Marinades, Sicilian Pesto, Spreads, Sun Dried Tomatoes, Vegetables, Yellow Onions. Bookmark the permalink. Actually, what is Sicilian pesto? The Gourmet Wino isn’t the only one who wonders. The familiar basil pesto originated in Genoa, where “the king of herbs” is plentiful. So, please let me know how the Sicilian version differs. Er, belay that. I overlooked something. Mea culpa. But I do wonder where this product is sold, and how to make it oneself. Do you happen to have a recipe? This sandwich looks delicious. Chicken thighs are great; I like them stewed in beer, lime, chili & cilantro for a great quesadilla. Regards accepted! 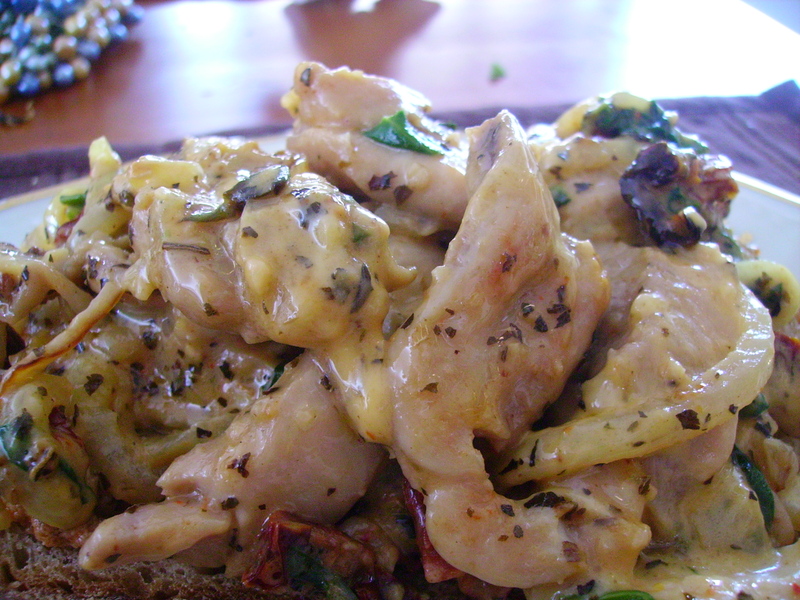 I love thighs in lots of things, especially stews or sauces because they’re so tender. This post made me laugh. It will surprise you to know, I was also a picky eater as a child. Also, loving the potato post below. 1. Why have I never heard of Sicilian pesto? I must buy some immediatley. 2. 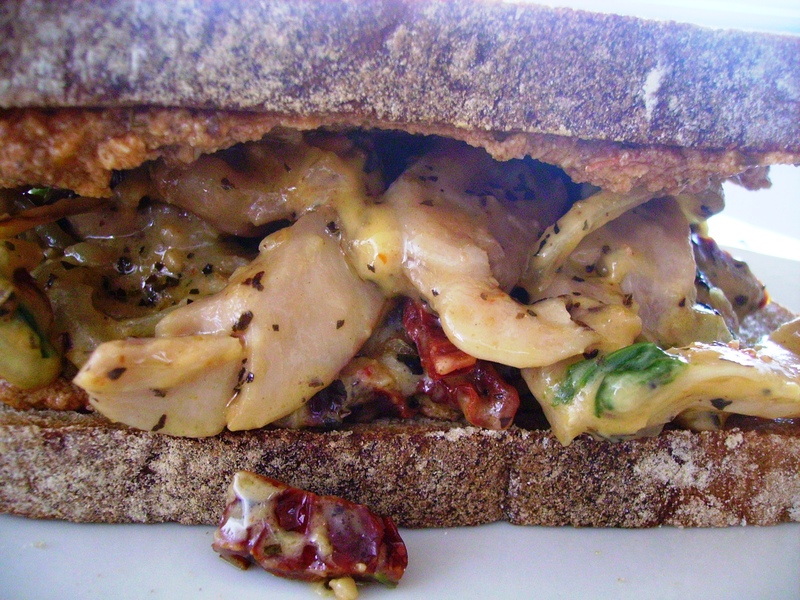 This sandwich looks like the greatest idea ever. You can’t go wrong with chicken thighs. Some of my favorite ingredients – I want this for lunch! This looks so good, thanks for sharing!